As I get ready to head out to Vegas for this year’s ISPA conference, I thought it would be fun to share the essentials I cannot leave home without. We’ve shared a peek inside our editor Kate’s travel gear as well as inside Wellness Travel expert Linden Schaffer’s luggage and a look at SpaRitual founder Shel Pink‘s beauty must-haves so now it’s my turn to show you a peek into my bags for my mind-body-soul travel must-haves! Sneakers – Okay, maybe I don’t technically pack my running shoes but I do always bring them, right on my feet. I know a lot of people believe in slipper type shoes for getting through security but for me, sneakers are bulky and I’d rather have room for my hair tools, so I know that I will go for a run or head to the fitness center if I make sure they are on my feet right as I walk out the door. I have an older pair of neon pink Nike trainers but I’m currently craving a pair of lightweight black customized Nike Free 4.0 Flyknits. 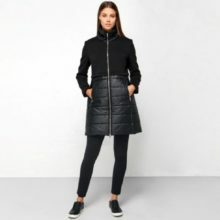 Lightweight Jackets – I have a love affair with outerwear and I never travel without my lightweight faux leather and my cropped denim jackets. I love their ability to not only keep me warm on chillier nights, but to make my dressier outfits more casual so I never feel like I’m over or under dressed. While I’m craving a Veda leather jacket like no other, the price tag is a little steep, so I love Blank NYC for a realistic faux leather. Skin Care – As an editor I’m lucky enough to have lots of samples on hand to keep my complexion on point but when I’m traveling I always bring the staples and yes, my list of staples is long, but my skin thanks me for it! Mask: Airplanes are so drying so I always put a bit of a mask in a travel-friendly container or pack one of those prepackaged masks that can double as your Halloween costume. 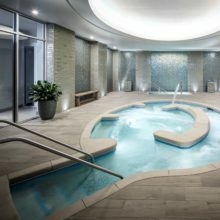 Ones I love include Red Door Professional Calming & Cooling Mask ($54; Red Door Spa locations) which is great for inflammation and AMOREPACIFIC Moisture Bound Sleeping Recovery Masque ($60) which is fabulous for long flights since it’s massaged into your skin and then you rinse when you wake up, leaving your skin super hydrated! Cleanser: My skin let me know pretty quickly that those little complimentary bars of facial soap most hotels offer weren’t going to cut it, so I never leave home without one of my favorite cleansers. Right now I love Fresh’s Rose Cleansing Foam ($38) because it is so gentle and relaxing to use, the rosewater soothes my skin, cucumber extract calms inflammation, and the other active ingredients help to hydrate skin. I also love powder cleansers since I can bring the full-sized versions. Serum: As I’m getting older I’m learning more and more the importance of serums and anti-aging products – they beat trying not to make facial expressions to battle wrinkles. A serum I’m currently obsessed with is Venox by Beverly Hills MD Cosmeceuticals ($149) because it’s a little bit like Botox in a bottle. It uses SYN®-AKE, a synthetic peptide that mimics snake venom and inhibits muscle contractions, while collagen-boosting peptides work to plump and firm skin. Another favorite is Kate Sommerville’s Quench Oil Free Hydrating Face Serum ($75) it’s like instant radiance! Toner: My toner game has really stepped up since the high school days of Sea Breeze. I always pack my go-to: Amala’s Rejuvenating Toner which is like a chocolatey treat for my skin and my sense of smell! Moisturizer: I have dry skin so from my face to my toes I need to pack moisturizers wherever I go. For my body I use a combo of cellulite-reducing lotion and a nice-smelling body butter and for my face I switch it up constantly but I really love the AMOREPACIFIC Moisture Bound collection! Lip Balm: Flying is so drying especially on my lips and I never travel without my arsenal of lip balms – currently reaching for Waxelene ($3.99) it’s a petroleum jelly alternative that is super hydrating and all natural and Stromaderm Lip Complex which plumps and lightens my lips. Babor’s FluidsFP: Yes, Babor gets its own spot in my beauty bag thanks to the beauty ampoules. Starting at $36 they have concentrates for everything from moisture to anti-aging to vitamins and more. When traveling I love the Stop Stress Fluid ($48) since it calms redness and helps to soothe my sensitive skin. Makeup Remover Wipes: Makeup remover is a must-have and I love Simple Cleansing Face Wipes, they don’t irritate my skin or eyes and remove all of the makeup I like to plaster on my face. Eye Cream: Another must, eye creams keep away dry skin and fine lines. While traveling it’s great to have a multi-tasker and Farmaesthetics’ Eye Bright ($25) is perfect! It is a makeup remover and a treatment oil so you get a lovely soothing and calming herbal eye treatment as you remove mascara. Hair Care – I’m sure by now you can tell I love beauty products and hair care is no exception. I always bring my own blow dryer because those foldable ones usually provided aren’t powerful enough for this mane. I love my Rowenta Inspiration Pro™ Auto Sensor™ Hair Dryer ($159.99; ulta.com). I have found my drying time has cut in half and my hair is always full and shiny. I also always pack my favorite Sulta Bombshell 1″ curling wand ($130) and all I will say is that this was my best investment to-date and if it ever breaks I’ll be first in line to buy a new one. While I’m okay with hotel shampoo and conditioner I do always pack my Oribe Gold Lust Nourishing Hair Oil ($36), it’s great for when I want a sleek blowdry or a frizz-free head of curls. My Mists – My husband laughs as I get ready for bed because my routine includes my aromatherapy mists and to ensure a good night’s sleep on-the-go, I always bring them with me. I love to alternate between my Lotus Wei Quiet Mind Mist ($40) and my Amala Lavender Room & Linen Mist ($24) they both help to calm my mind, make my stress disappear, and get my mind and body ready to sleep. Other travel must-haves? More water than I know what to do with, my trusty Kindle, a couple magazines to catch up my fave celebs (guilty pleasure), and a fun adventurous attitude! What are some of our travel essentials? Share them below!